On September 13, the Middle Tennessee QDMA Branch held its kickoff event with a mini-field day at the Gaylord Opryland Hotel and Resort's Outdoor Demonstration Area. 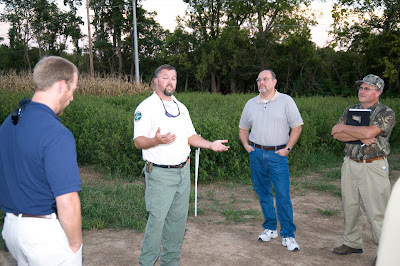 Chris Wolkonowski, Area Resource Biologist with the USDA Natural Resource Conservation Service and Clint Borum, Private Lands Biologist with the Tennessee Wildlife Resources Agency were on hand to discuss the planning and initial implementation of a conservation plan they developed for the 100 acre site. 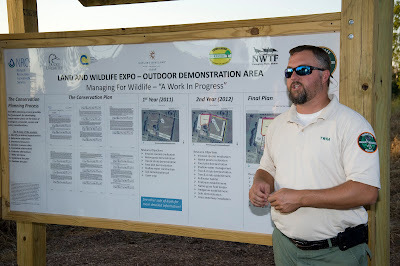 Chris and Clint discussed how they developed the conservation plan in conjunction with the landowner, taking into consideration the landowner's objective for the property, which was to develop it into a showcase for wildlife habitat management practices. The plan will take three years to implement and involves removal of invasive species, establishment of early successional habitats, field borders, firebreaks, upland wildlife habitats, native warm season grasses,foodplots, and much more. 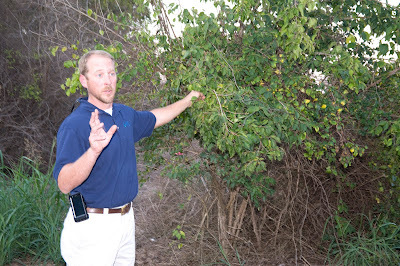 Attendees were treated to a wide ranging discussion of the steps that have been taken thus far, including herbicide applications to control invasive species like johnson and bermuda grasses and chinese privet, establishment of cover crops to control erosion and reduce browsing pressure, and the planting of numerous test foodplots in a wide variety of seed mixes. NRCS Biologist Chris Wolkonowski points out one of the invasive species, bush honeysuckle, that is being eradicated from the site. Of particular interest to the QDMA members on hand was a discussion of the key ingredients in a habitat management plan designed to hold and develop quality deer on a particular piece of property. Their number one recommendation... cover is king. Food is generally not a limiting factor in the southeast, but cover is. They recommend creating cover by establishing early successional habitats through clearcutting of selected areas of the property. They also recommend taking steps to encourage the growth of native plant species which can be more nutritious and more drought resistant than cultivated species. Finally, after those steps have been taken, then the landowner should think about adding foodplots. Their recommendation for foodplots... a mixture of red, white, and crimson clover which will provide three to six years of high quality, low maintenance food at a minimal cost. TWRA Biologist Clint Borum discusses foodplot strategies in front of the foodplot demonstration area. Clint and Chris recommended several books for those who are interested in learning more about native plants, invasive plants, and foodplots. Native Warm Season Grasses, by the UT Agricultural Extension Service. Available in print through your County/Regional UT Extension office which can be located here. Or, if you prefer, it can be downloaded free here. If you download it, you will need to download each chapter separately. A Guide to Successful Wildlife Foodplots, by the UT Agricultural Extension Service. Available in print through your County/Regional UT Extension office which can be located here. It can be downloaded for free in its entirety here. A Landowner's Guide to Native Warm-Season Grasses in the Mid-South, by the UT Agricultural Extension Service. Available in print through your County/Regional UT Extension office which can be located here. It can be downloaded for free in its entirety here. Forest Plants of the Southeast and Their Wildlife Uses, by James H. Miller and Karl V. Miller. Available from Amazon. Weeds of the Southeast, by Charles T. Bryson. Available from Amazon.